Last weekend, my wife and I went to Roosevelt Island, which we had never visited before. While checking out the ruins of a former smallpox hospital and the gorgeous cherry blossoms that line the shore, we also happened to look over at the U.N. headquarters. We were horrified to discover just how dingy and nasty the structures were. While the U.N. has always been a little strange looking, it was starting to get downright grubby. The beautiful blue Secretariat tower looked grayish, and the General Assembly building, which was once gleaming white, now resembled a scuffed sneaker. Apparently, the interior is also showing its age. Constructed in the early 1950's, the buildings have exposed asbestos insulation, dripping pipes, leaks, and lead paint. Although the U.N. is on international territory, and is thus not required to comply with New York City safety codes, it racked up an amazing 866 violations during a courtesy inspection last year. After years of spirited debate, the headquarters has finally been scheduled to undergo a massive, $1.9 billion renovation, which is expected to take five years. 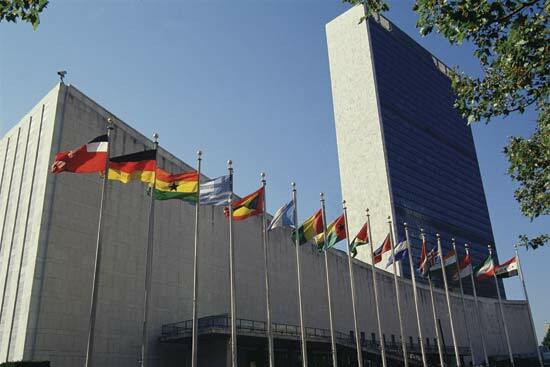 Rather than find short-term housing elsewhere, the United Nations has decided to construct a gargantuan pre-fab building on the North Lawn of the complex. Ultimately, the U.N. hopes to return the North Lawn to its current, empty, state, so the new home has been designed to be "intentionally ugly," in the same style as "a Costco or a Wal-Mart." The cost of dismantling the eyesore has been factored into the overall project budget. Hopefully, this will ensure that the temporary building will be just that: temporary. Bruce Watson is a freelance writer, blogger, and all-around cheapskate. Having spent much of his childhood in "temporary" classrooms constructed from trailers, he hails the U.N.'s decision.